Ethics directly correlate with political ideology. Persons weak in ethics will tend towards ideologies that support central political authorities. The astrological indicators for ethical weakness and political authoritarianism are one and the same. To demonstrate this, I profile charts of personalities, entities, and events that are political... and those that are not, but are ethically notable. 1. Pallas is ruled by and septile the Sun (ethically strong). Pallas is also square the Nodes (a mixed indicator). The Sun, ruler of Pallas, is sesquiquadrate the South Node (ethically weak). Mixed signals. 2. Venus is conjunct the North Node but trine Neptune. More mixed signals. 3. Venus is sextile Pluto. 4. Jupiter at the IC, square Uranus and sextile Saturn (rulers of the Moon). 5. The Sun is ruled by Mercury, which is square Pluto. The formula is complete, but not particularly strong. If the formula were strong, we might see multiple events as per this example. Also notable: today's Mercury-Pluto-Uranus-Jupiter T-square is angular for the reported time of the event (quick, unexpected public death?). 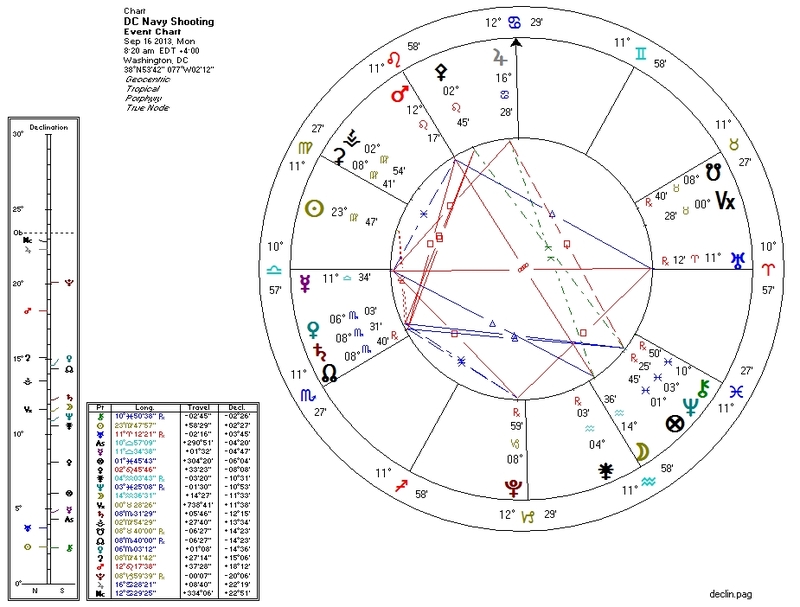 There is a tight triangle between Mercury, Uranus, and Mars (again, quick unexpected violence) and a Mars-Moon opposition (violence against persons?). Mercury is rising, as it is on the chart for the 9-11 attack in 2001.